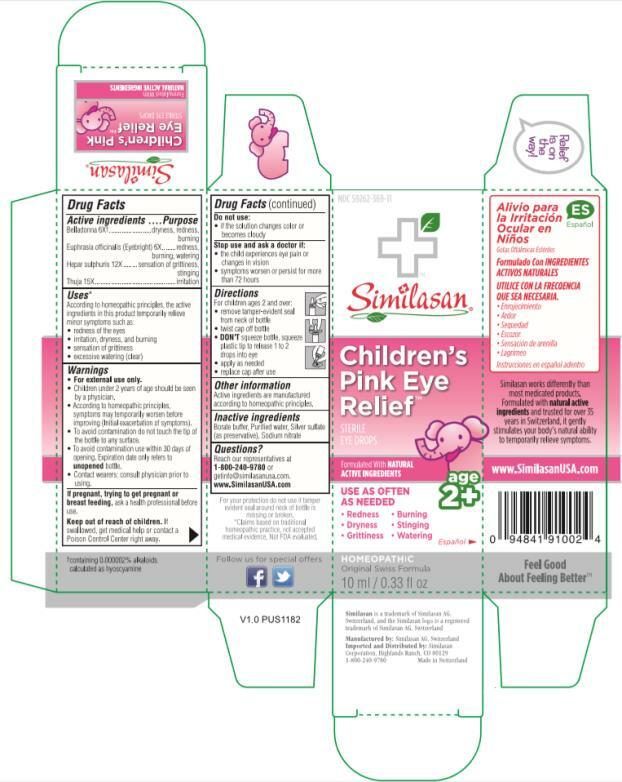 Proprietary Name: Childrens Pink Eye Relief What is the Proprietary Name? Non-Proprietary Name: Atropa Belladonna, Calcium Sulfide, Euphrasia Stricta And Platycladus Orientalis Leaf What is the Non-Proprietary Name? Childrens Pink Eye Relief with NDC 59262-369 is a a human over the counter drug product labeled by Similasan Corporation. The generic name of Childrens Pink Eye Relief is atropa belladonna, calcium sulfide, euphrasia stricta and platycladus orientalis leaf. The product's dosage form is solution/ drops and is administered via ophthalmic form. • For external use only.• Children under 2 years of age should be seen by a physician.• According to homeopathic principles, symptoms may temporarily worsen before improving (Initial exacerbation of symptoms).• To avoid contamination do not touch the tip of the bottle to any surface.• To avoid contamination use within 30 days of opening. Expiration date only refers to unopened bottle.• Contact wearers: consult physician prior to using.